After the formality of the day’s events in Windsor, a handpicked 250 guests got the chance to let their hair down at an exclusive after party and dinner thrown by Charles. After the party came the real party. 250 handpicked guests partied the night away at Frogmore House, a half-hour drive from Windsor Castle, where speeches were made by Prince Charles, Prince William and, in a break from tradition, by the bride herself, Meghan Markle (or, as we must now try and call her, the Duchess of Sussex). Traditionally at an English wedding a speech is made on behalf of the bride by her father, but even had Thomas Markle been able to attend, Meghan had always planned to make her own speech. It was yet another way in which Harry and Meghan put a modern stamp on a day otherwise thickened with tradition. The party concluded with a magnificent fireworks display. Guests tucked into candyfloss and ‘dirty burgers’—washed down with a cocktail featuring ginger and rum named When Harry Met Meghan, in an apparent nod to Harry’s red hair and the film ‘When Harry Met Sally. Prince Charles’s speech reportedly had the guests laughing as he reminisced about feeding Harry his bottle and changing his nappy, William’s speech was said to be ‘cheeky’ and the bride-to-be used hers to thank her new in-laws for welcoming them to the family. Few other details and no pictures of the after party have leaked out, showing perhaps the wisdom of inviting just 250 guests. Invitees included George and Amal Clooney (who were held at the entrance for ten minutes while police verified their identity), Serena Williams, and David and Victoria Beckham. James Corden, a friend of Harry’s, compered the exclusive event, which kicked off at 7 pm. Sarah Ferguson was said to be “deeply upset” after being left off the list for the evening celebrations although her ex-husband Prince Andrew and her daughters Beatrice and Eugenie were invited. 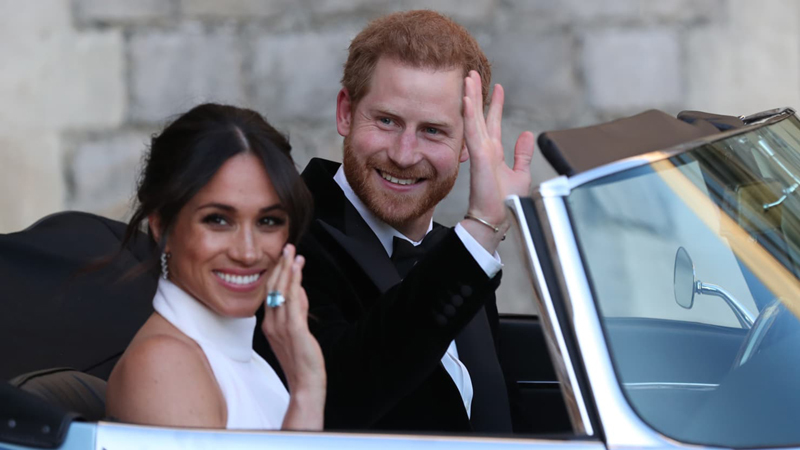 Guests tucked into candyfloss and “dirty burgers”—washed down with a cocktail featuring ginger and rum named When Harry Met Meghan in an apparent nod to Harry’s red hair and the film When Harry met Sally, Mail Online reports. Music was curated by DJ Sam Totolee, who also performed at Pippa Middleton’s wedding. Harry—introduced by best man William—made his own speech earlier in the day at the lunchtime reception hosted by the Queen in the grounds of Windsor Castle. A guest told People: “He promised that all the Americans wouldn’t steal the swords. Harry and Meghan drove from Windsor to Frogmore House in an original 1960’s silver blue Jaguar E-type, which had been converted to electricity. Meghan, now the Duchess of Sussex, changed from her Givenchy wedding dress into a custom silk Stella McCartney evening dress in “lily white,” and Meghan also debuted a new piece of jewelry: an aquamarine ring which once belonged to Princess Diana. Other guests arrived by private cars and double decker bus. After the reception ended with a lavish fireworks display, some guests reportedly travelled to the Chiltern Firehouse bar in London to carry on the night.